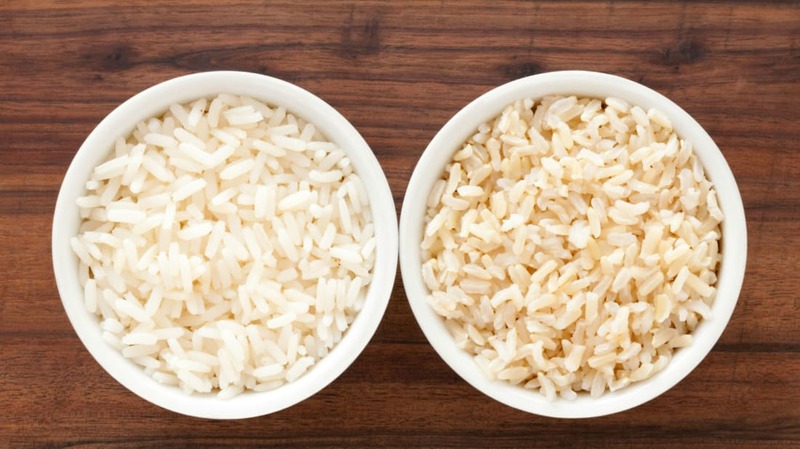 Brown vs. White Rice: Which Is Healthier? Rice is one of the most popular carbohydrate staples in the human diet, accounting for 19 percent of all available calories worldwide. We’ve come to regard brown rice as the healthier option, since it usually contains more fiber. But is that true? And is there really that big a difference between the two? According to MedicalNewsToday.com, the nutritional breakdown for each type would appear to give brown rice an edge. Although brown rice packs in more calories—it comes in at 248 calories per cup to white rice’s 205 calories—it features 3.2 grams of fiber to white’s paltry .6 grams. Brown also contains more magnesium, zinc, and niacin than its blanched counterpart. Fiber is generally regarded as being beneficial for intestinal health, as well as more filling. Coupled with more vitamins, that would appear to make brown rice a clear winner. But that really depends on who’s eating it. Pregnant women, for example, should ingest more folic acid, which can reduce the potential for birth defects. White rice is fortified with folic acid (folate), nearly eight times as much as brown rice. If you need more potassium in your diet, brown would be the best option. Those on low or high-fiber diets would also make selections based on the fiber content of each. Additionally, white rice has been linked to higher incidences of type 2 diabetes. A Harvard examination of several studies indicated that people who ate white rice servings three to four times daily were 1.5 times more likely to develop the condition, which researchers believe is related to spikes in blood sugar. So, brown or white? In most instances, unsurprisingly, brown is a better choice, but individual health needs could influence your decision.